Yet another outstanding addition to the Great Chirra (Fuller) family, the “Jr. Shree 5 Chirra”, as defined by its name is the smaller and shorter but improved version of the gigantic “Shree 5 Chirra (General)”. 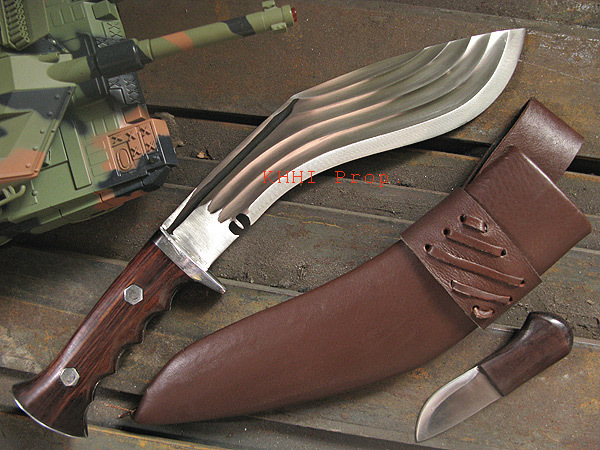 The kukri has also been bettered by adding vertical guard, finger resting curvatures and its handle fixture further strengthened by using the L-Key configuration. 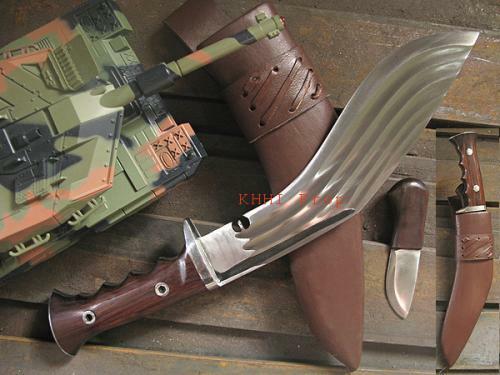 The Chirra-walas khukuri knives have achieved remarkable heights on both crucial grounds –usage and demand. And hence keeping the very thing in mind Jr. Shree 5 Chirra (Sherman) was created by KHHI for those who prefer the popular chirra version in more practical size, more comfortable feel and more durability. The interesting and appealing title, “Sherman”, follows to denote the knife’s look and features of the legendary US made med size tank, the M4, later named as “Sherman” after the famous Union General William Tecumseh Sherman, that was a reliable and highly mobile workhorse that played a decisive role to win the WW2 for its masters. Blade: Small but board that is easy to use (very functional) yet heavy enough to perform heavy jobs. The 5 x Chirra (fuller) in its blade is not only the demonstration of pure skill and expertise that makes the kukri look so beautiful but also supports the knife physically and technically by equally distributing the impact/pressure felt by the edge when slammed against a object. The shock felt by the edge is evenly distributed in a wavy form to all parts of the blade before it finally reaches the spine (stress cannot go straight to the spine). The blade thus does not rattle or tremor since the impact is minimized by the chirras/fullers. The chirras also cut down the unnecessary weight of the blade. Guard: It is one very important character added that will always safe guard the user’s hand so that injuries and wounds can be avoided. The guard works as a divider and always keeps the hand away from sharp edge of the blade. It comes even more useful in wet and slippery conditions and while stabbing. Handle: Sherman’s handle is another power-pact feature. Its wooden handle has the powerful L-Key configuration where nut-bolts are used instead of aluminum like in others to fix the wooden plates to the full flat tang. This makes the handle stronger and more durable. Imported epoxy is further used to reinforce the whole fixture. Similarly finger rest curvatures (grips) are crafted in the front side of the handle where each finger slides in comfortably providing a very easy, secure and sturdy grip the whole time. The handle blends in with the hand and gives a rock solid grip. B-Up Knife: A 2.5 inch bladed supporting utility knife for small games and jobs - ones that may not be possible by the mother blade. An important inclusion that could come handy at anytime in any place. Blade size: 9 inches approx.